All of the composers represented on this CD have reputations for producing surprising works, and there are certainly a few surprises here. The composers you might expect to be the most radical – Ives and Cowell – turn in the most listenable scores, while among the more traditional names, Copland in particular indulges in some uncharacteristically caustic Modernism. Don't be put off though, because every work is fascinating, and the other composers grab the attention just as well, and without recourse to unfriendly harmonies. A late work by Amy Beach opens the programme. There is a feeling of French Impressionism here, but she always keeps her feet on the ground with rigorous Brahmsian thematicism. One of her favourite textures is a solo string line with wispy obbligato from the piano right hand. It's all very attractive, and there is some real dramatic substance too. The early Piano Trio by Charles Ives anticipates many of the musical ideas for which he later became famous. Disjunction, especially between the instruments, is the order of the day, and however progressive his textures become, they are always underpinned with a wry humour. The second movement is entitled TSIAJ, an acronym for This Scherzo Is A Joke. The movement is a classic Ives montage, with all sorts of borrowed tunes and melodic ideas overlaid and brought into collision. The Bloch Three Nocturnes, as the name suggests, is a more staid affair. Each of the three has a very particular atmosphere, dreamy but with clear harmonic identity. Each comes in at between two and three minutes, which is really a bit short for this sort of music, and Bloch's minimalist successors would have no qualms about stretching each out to at least an hour. 'Vitebsk' by Copland is apparently a study on a Jewish Theme. Judging by the angularity of its harmonies and voice leading, he is intent on exaggerating the exotic dimension of his material. But while the ethnography may be suspect, the music hits the mark, and Copland cleverly employs the distinctive motivic identity of his theme to create propulsion and identity. 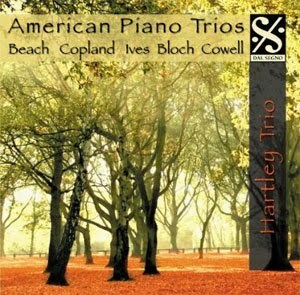 The Henry Cowell 'Trio, Four Combinations of Three Instruments' is the real surprise on the disc. Stylistically, it is easily the most conservative of the works. It is easy going and melodic, often playing out as just one line doubled between the instruments or simple two part textures. But if you listen closely, you can hear some distinctive Cowell traits. In the second movement, for example, the piano plays almost throughout in clusters, but the clusters are carefully chosen and played so quietly that they sound like extended diatonic chords. An experimental work, then, but one that is also calculated not to offend. The performances are good, if not outstanding. The intonation between the violin and cello is an occasional problem. The recording was made in 1992, and while the sound is acceptable, the recording shows its age. I'd have liked more piano in the mix, not that it is ever obscured, but it is sometimes deprived of the chance to lead the ensemble. This is a fascinating disc, and the gaps it is likely to plug in your CD collection are the sort of gaps you didn't know you had. The packaging is on the perfunctory side, and at the risk of sounding hopelessly pedantic, the liner notes could do with a friendlier font. But I'd recommend it to the curious, and especially to players in adventurous piano trios on the lookout for new repertoire. Many of these works deserve a much wider audience.